Shift from Imports to Production in Eastern Europe Continues. What started in 2005, continued in 2006: the shift of the European bike sector from importing complete bicycles from Asia to having them produced in Eastern Europe? That shift also contributed to a 7% drop in the production of bicycles in the old European Union of 15 member states. For bicycle consumption, 2006 wasnt the best of years although the damage was relatively small. What started in 2005, continued in 2006: the shift of the European bike sector from importing complete bicycles from Asia to having them produced in Eastern Europe? That shift also contributed to a 7% drop in the production of bicycles in the ‘old’ European Union of 15 member states. For bicycle consumption, 2006 wasn’t the best of years although the ‘damage’ was relatively small. Cold and wet spring weather that continued into early summer left its mark on bicycle sales throughout Europe in 2006. 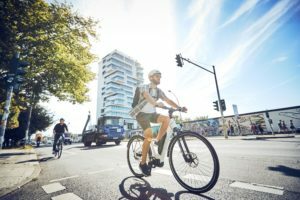 The economies of many EU member states were still recovering in 2006, and also the football World Cup in Germany diminished interest in cycling in the vital June/July period. In order to attract consumers in such market conditions, prices for bicycles dropped. This happened in France to such an extent that bike makers were forced to stop production for supermarkets. As a result, production in France dropped 25%! The main reason for the sourcing shift from Asia to Eastern Europe is of course the anti-dumping duty for China and Vietnam that came into force on July 14, 2005 and which run up to July 2010.With 48.5% dumping duty on complete bicycles imported from China and 34.5% on bikes produced in Vietnam, it’s obvious that companies sourcing bicycles turned to other producers. But as well as the dumping duties, lead times are also having a stronger effect as ever before on sourcing bikes from the other end of the planet. This is especially true for a company like Decathlon, which was the biggest bicycle seller in Europe in 2006 with an estimated total sale of over two million bikes. Sourcing such quantities from Asia puts huge pressure on logistics. Purchasing closer to market is the obvious alternative and that’s just what Decathlon is up to with the announcement it was setting up a bike production facility in Lille, France. In Eurostat (EU’s custom data bureau) figures the shift from sourcing in Asia to production in Eastern Europe reads as follows: already mentioned is the 7% production drop in the ‘old’ 15 member states EU. That figure is in contrast with what the 25 EU member states imported from each other; Eurostat ranks such statistics as ‘intra’ which is one EU member state importing from another EU country. ‘Extra’ EU refers to the importing bikes from outside the European Union. The 2006 intra-EU import figure increased by 830,000 bikes to a total of over 8.2 million; a jump of 11.2%. Extra-EU imports however dropped by 3.8% or 345,000 units to a total of close to 8.8 million bikes. The extra-EU import total remained bigger than the intra-EU figure. But not for much longer, if the trend that started in 2003 continues. In the 2003 – 2006 period ‘intra’ imports increased by over 3.8 million units, representing 87.6% growth. The same period shows a 7.6% drop in the import of complete bikes from outside the EU. Currently, imports from outside Europe (read Asia) account for 51.6% of total imports versus 48.4% from other EU countries. The total 2006 EU-25 bike import indicated by Eurostat as: ‘bicycles, not motorised with ball bearings, CN Code 87120030’ stood at slightly over 17 million units. This figure is up 3.0% on 2005 and shows a big 22.4% increase over the 2003 total import figure of close to 14 million units. 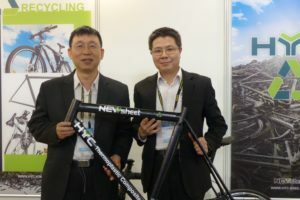 The new Eastern European member states stocked up bikes imported from China and Vietnam prior to their EU entry in order to circumvent the anti-dumping duties. Their striking 2005 import figures levelled off in 2006. In all the countries, bike imports from countries outside Europe have dropped and are now showing realistic levels. Before the new July 2005 anti-dumping duties for China and Vietnam came into force, China was Europe’s leading supplier of bicycles. Close to 2.5 million units were imported in 2004, a sharp contract with the 2006 figure. Last year 810,000 bicycles were imported from the Peoples Republic by EU’s 25 member states. The same goes for Vietnam. During 2004, a total of 1.8 million bikes were imported from Vietnam; a number that fell to 420,485 in 2006. What the 2006 import figures for bicycles from Eurostat also make very clear is how import sources diversified after China and Vietnam were hit by the dumping duties. Eight different countries are now in the Top Ten list of main bike suppliers, which is led by Taiwan. The island off the coast of China is by far the leading exporter to the EU, with almost 2.8 million units imported by the EU-25 in 2006. In 2004 this figure stood at 2.3 million. After China with its 810,000 units exported to Europe come Malaysia and Indonesia that each exports about half a million bikes to Europe. Since 2004, imports from Indonesia more than doubled while Malaysia wasn’t even listed in the top ten in 2004. Vietnam, despite the 34.5% dumping duty, is also still doing its best with 420,000 units exported to the EU, closely followed by Cambodia and Bangladesh that each do close to 375,000 bikes. Striking is also the import volume from Tunisia and Turkey; both countries export about a quarter of a million bikes to Europe. The fact that since the new anti-dumping duties came into force for China and Vietnam, the import diversified to the named countries is also strongly influenced by the European Union’s General System of Preferences. This system grants underdeveloped countries reduced import duties for bicycles. Much of the named countries are able to export bicycles duty free to Europe. Last year bicycle production in the ‘old’ 15 member states of the European Union dropped for the first time in history below the 10 million mark. 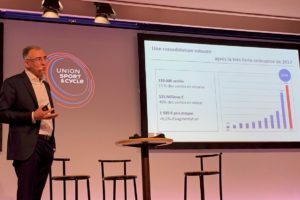 The figures presented are from the national associations, united in COLIBI (Comité de Liaison des Fabricants Européens de Bicyclettes or committee for European bike makers) combined with estimates for countries that don’t have such associations. 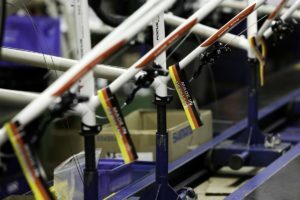 Unfortunately we are not able to present bike production figures for the whole of the 25 EU member states, not to mention the current European Union that nowadays also includes Rumania and Bulgaria. The only figures available for the two countries that just recently joined the EU are their bicycle import figures from countries outside Europe which are mentioned below the table for the import figures. A total of 9.6 million bikes were assembled in the 15 old member states in 2006; 7.0% or 720,000 units down on the 2005 total. The biggest drop in production took place in France. Here Cycleurope and the Accell Group through its subsidiary Mercier suffered from the price war triggered by the all mighty supermarket chains. Accell announced last year it was stopping production for supermarkets; Cycleurope was forced to enter into a sale-leaseback arrangement in order to finance the dismissal of some 300 workers at the two facilities the company operates in France. In Germany, Europe’s biggest bike market, production dropped below the 2.5 million mark last year. That was not the case in the second largest production country for bicycles in the EU-15: Italy. Here production stayed level with somewhat over 2.4 million units. In sharp contrast to the drop in production in almost all other EU countries, is the rise in The Netherlands. 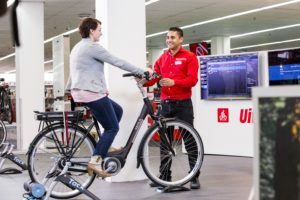 According to the official figures (not from national bike industry association RAI-Vereniging, but from the Dutch statistical bureau) bike production increased 8.1% to close to one million units. In fact the production number stands at well over that one million units mark. That’s because the Dutch statistical bureau only counts production at companies that have over 20 employees. However, as lots of bikes are assembled in Holland at social welfare bike facilities, these are not included in the statistics. Companies like the Dutch Bicycle Group or Razor bikes have bikes assembled at these social welfare facilities. One more thing on the production increase in Holland; it’s also a clear indication of the effect of widespread bike use on the market. It was not only bike production that went up in Holland – bike consumption also increased. As there are no figures available on bike ‘consumption’ (deliveries to dealers) in the new European Union member states, we have to limit the findings on bike sales to the old 15 member states. Here 2006 consumption stayed at almost the same level as in 2005. 18.4 million bicycles were delivered to dealers or other distribution channels; a drop of 41,000 units or 0.2% compared to 2005. A result that isn’t that bad considering the poor market conditions outlined at the beginning of this report. As with production figures, the national associations united in COLIBI accounted for most of the consumption figures. In the countries without such associations estimates were made by local industry insiders as well as Bike Europe’s correspondents. As in 2005, no big changes took place last year regarding bike sales in the old EU member states. Germany, with a share of 24.2%, is by far the biggest bicycle market in Europe, unsurprising given its population of 85 million and the fact that it is Europe’s biggest country and economy. France is runner up and holds a market share of close to 20%, followed by the UK with its 3.3 million units consumption, which stands for a 17.9% share. The top five list of biggest markets includes Italy with a consumption that is growing toward the two million units mark and a share of 10.6% followed by The Netherlands where bike sales climbed 6.7% in 2006 to well over 1.3 million. With that the smallest country of the 15 states, but with the biggest bike usage, is the fifth-largest market in Europe with a 7.2% share. How many bicycles are currently sold on the European bike market with its 27 member states and total population of close to 500 million consumers? To give an accurate answer to this simple question is not easy because, as everybody working in this sector knows, accurate figures are hardly available. But with Eurostat’s 2006 statistics, the production and consumption figures from the national associations, combined with, for the countries without such associations, estimates by local industry insiders as well as Bike Europe’s correspondents, we can make a calculated guess. For that we made the usual calculation by adding import and production figures and subtracting exports. The Eurostat export figure is the one for bike export to countries outside the EU territory. The result of that calculation is shown on these pages. Is a sale of 29 million bicycles in the EU-27 way out of proportion? It is when looking at what Shimano said after the ten Eastern European countries joined the EU. In 2004 Shimano’s estimate of the total market volume for the EU-25 stood at 22 million bicycles, way below our calculated guess of 29 million. So, maybe the conclusion here is that the real figure is between 22 and 29 million. If anyone has the real (or a better calculated) figure, please contact Bike Europe! Will the shift in importing from Asia to Eastern Europe continue in the coming years? As well as anti-dumping duties, the exchange rate of the US Dollar will also strongly influence this trend. With the dollar tumbling the prices for products sourced in Asia are dropping when calculated against the super strong Euro. Naturally, this adds to the advantages of sourcing in the Far East. What does the future have in store for the bicycle sector in Europe? What’s the outlook for the years to come? One thing is clear: in these days of concern about climate change, the bicycle is THE mobility product for short distances. The bicycle is being rediscovered by politicians and mobility policy makers. Just look at what Paris Vélib has brought about! With mobility projects like Vélib starting in almost every capital in Europe, a positive effect on sales can be expected. The same goes for the aging of the population in Europe, in combination with greater attention being paid to health and fitness. Bicycles have the potential to attract new Baby Boomer customers. The question remains, however, whether the bike sector is able to attract such discerning customers to its products? If that happens, one can safely predict that there’s a bright future ahead.